My old friend the sewing machine has been sitting sadly, waiting for me to come back to her. I can’t even remember the last time I sewed something (it was probably more quilt blocks), but whatever it was had purple bobbin thread. Hmm. I finally uncovered her so I could sew up my August quilt blocks, just in the nick of time. I really liked the assignment: paralell strips of color on a white background, however you wanted to do it. I used an improvisational technique for these, working with the scrap fabrics Daria sent in the size that they came. First, I edited the choices and only used 6 fabrics for each square. Then, since I had about an 8″ width (selvedge to selvedge) of white fabric, I cut it into three 12″ long pieces and whatever was left (with the aim being 12″ quilt blocks). I set aside 2 of these cuts, one for each block, then cut the other pieces into strips that matched the widths of the fabric. I sewed a white strip to either side of each print fabric and laid them out, figuring out where I wanted the prints to fall and trimming the white parts as necessary. Then I cut one of the 12″ cuts I set aside into two 2″ strips and 4 approximately 1″ strips. 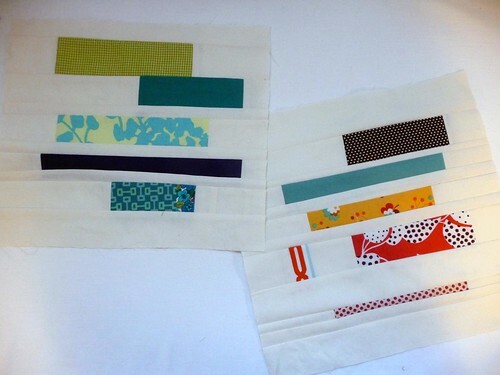 I sewed the 1″ strips between the print/white strips and sewed the 2″ strips to the top and bottom edges. I changed up the arrangements slightly as I went, which is part of the fun of doing it as you go! On the second square, I was really running low on white fabric. (You can’t tell in this picture, but I sewed three white pieces together to go next to the bottom printed strip). At first I thought I would also have to leave the top strip off and let Daria add it, but then I kind of liked the effect of the 2 prints touching, so I went with it and was able to add the border. It still needs a strip of white fabric on top to make it the right size, but that’s something she can easily fix when she gets it (I didn’t have exactly the same white, so I’d rather let her match them). I’m really enjoying sewing the blocks, they give me a little something fun to do when I have other non sewing deadlines. Absolutely LOVE what you have done! Will have to re-read your instructions a few times before attempting it myself! 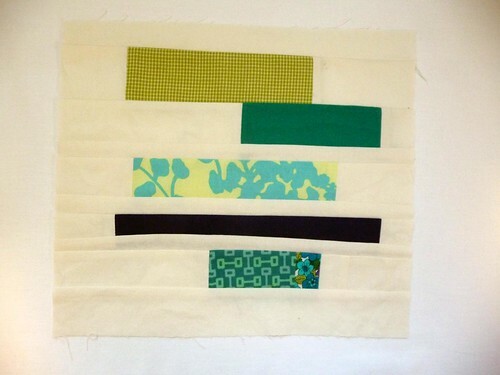 Love modern style quilting! Reminds me of Denyse Schmidt's quilts. 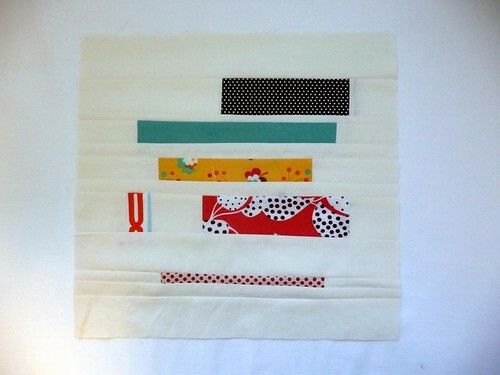 I really love this modern approach to quilting! I love making quilt blocks. Free-form blocks are a lot of fun, too! Sounds relaxing.